Kosovo is a small landlocked country of about 1.8 million people, approximately 90% of whom are Albanian Kosovars. The remaining 10% are composed of Serbian Kosovars (about 7% of the population) and minorities including Roma, Ashkalie and Egyptians (3%). By organizing a fact finding mission to Kosovo, the FXB Center aims to expand its research into instances of insecurity and safety of the Roma population and to explore the educational, training, and employment barriers for Roma children and adolescents, as well as the drivers of their success. The field team who is in Kosovo on behalf of FXB will draft a report based on field documentation in Pristina, Mitrovica and Prizren, and on interviews conducted with the main stakeholders related to the Roma, Ashkali and Egyptians communities. The Roma, Ashkali and Egyptian (RAE) communities have different traditions and also different languages: the Roma generally speak Serbian, and the Ashkali and Egyptian speak Albanian. The Roma community, we were told this morning by Roma community members, feels pulled between Albanians, who see them as pro-Serb, and Serbians, who are suspicious of them as Albanians. “Roma are between two fires because they are…treated like Serbs by Albanians, and treated like Albanians by Serbs,” says Shahira Gashi, an Obelic community member. Meanwhile, Roma have lower life expectancy, less access to jobs (there is over 90% unemployment among the Roma communities as opposed to approximately 40% for the rest of the population), and greater difficulty staying in school and reaching university-level education. The field team visited two Roma communities on the first day. The first was the Roma and Ashkali neighborhood surrounding the town of Obelic, which is located next to an electricity plant, a factory, and a coal mine. The air pollution was visible. The second Roma community was located in the town of Gracanica, a small Serb enclave near the Kosovar capital of Pristina. Gracanica does not share the environmental issues observed in Obelic. (a) Access to documentary proof of identity remains a huge issue for the Roma community. Vineta Berisha, a member of the Obelic community, is the mother of seven children and explained the difficulties she faces with documentation. “I have seven kids; six are in school. My oldest daughter is a volunteer at the Center [Balkan Sunflowers Center], and she is in her second year of medical high school. The others are in primary school, but one doesn’t have a birth certificate and it would be impossible for her to enroll in school,” she says. When asked why she doesn’t renew the documents, Vineta told us it would take too much time, hassle and expense. Her family’s documents are under the “Serbian” administration, and the only issuing authority for documents under this system is located in Nis, a town in the south of Serbia that is a long and expensive journey from Obelic. As a result, her own ID has been expired for seven years, and she cannot renew her child’s documents either. 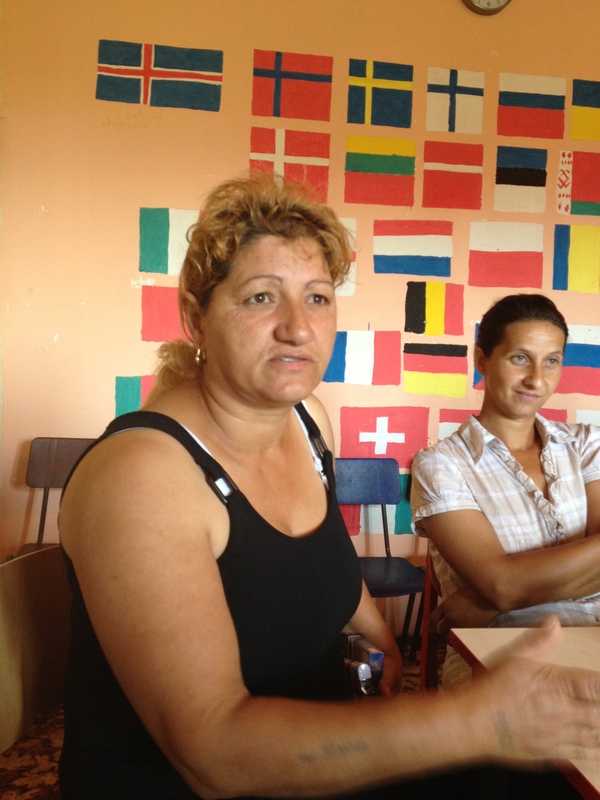 Roma mothers at the Sunflower Balkan NGO. (a) Lack of access to or prospects of employment is a considerable worry. On her son’s prospects after schooling, Shahira Gashi, another member of the Obelic community, says: “The situation is hard. We can’t predict the future so we don’t think about it.” There is corruption and discrimination in access to public jobs, including positions posted for minorities. RAE view the international community as their only support. “The Kosovar Albanians have their politicians to look after them, the Kosovar Serbs theirs, and we only have the International Community,” comments Bajrush Berisha, a community leader in Obelic. (c) Access to higher education is a major issue for RAE young adolescents. “Kids get more out of education [now], but they don’t have the family conditions to make it to the next level. My oldest son can’t go to university because I can’t afford to pay things like entrance fees and living accommodations,” says Sabit Mustafa, an Obelic community member. (d) While young girls in RAE communities generally still trail behind boys when it comes to education, the Balkan Sunflowers Educational Center in Gracanica has succeeded in raising the level of education for both girls and boys in the community. According to Afrim Osmani, in 1999 about 20 Roma kids were enrolled in primary school and only one in high school. Nowadays, more than 110 RAE kids go to primary school, and 11 to 12 RAE adolescents attend high school. A big achievement for the community is that half of those who attend high school are girls, a dream that was not possible a couple of decades ago. But generally, in regard to girls’ education and early marriage, the treatment of girls and women depends a lot on the families or different RAE subgroups. Afrim explained that some families or subgroups understand the importance of education and sending kids, both girls and boys, to school, while others follow more traditional practices and keep their daughters at home. Some, he discussed, marry their daughters when they are 13 or 14 years old.